“Gardening enhances our quality of life in numerous ways: providing fresh food, exercise and health benefits, opportunities for multi-generational and life-long learning, creating pleasing landscapes and improved environment, and bringing people together. 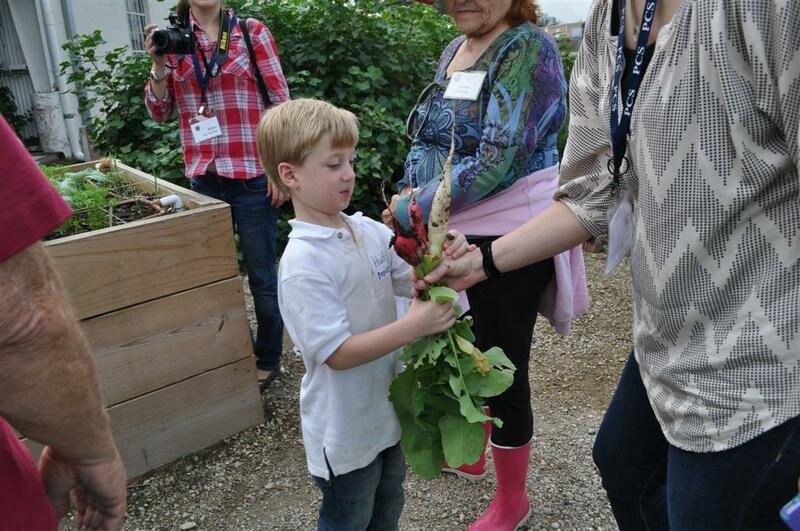 Garden-based learning programs result in increased nutrition and environmental awareness, higher learning achievements, and increased life skills for our students. They are also an effective and engaging way to integrate curriculum and meet learning standards, giving young people the chance to develop a wide range of academic and social skills. Last week we had 54 kindergarten students from Providence Christian Academy in our gardens learning about chickens and eggs, veggies and herbs, compost, and observing our gardens full of Monarch butterflies, ladybugs, and bees. Meet Opal, named for Judy’s Aunt Opal. Opal is a Silkie with black skin and bones and 5 toes instead of the normal 4. She is a wonderful brooder and mother. Eat your veggies! We let the children take home the radishes they picked and they fed the radish tops to the chickens. We are still booking fall field trips. The Gardens and our Dallas County Master Gardeners are always ready to teach in the garden! Posted in Fall, Trees at The Raincatcher's Garden and tagged City Chickens, outdoor learning, school field trips, School Gardens in Dallas, vegetable gardening. Bookmark the permalink. Being with the school children last week both days was really enjoyable. They were full of wonderment that was fun!